Thoroughly wash dal and soak in water for 15 minutes; then pressure cook the toor dal with sufficient water and a pinch of turmeric powder. Heat oil in a pan; fry chana dal, urad dal, coriander seeds, cumin seeds, fenugreek seeds, red chillies and black pepper seeds till brown. Grind the fried spices along with coconut powder into fine paste. Sambar powder is ready now. Add the chopped vegetables to the dal. and mix well. Then add tamarind paste, asafoetida powder and sambar powder along with sufficient water for the gravy. Cook until the vegetables are tender. In a pan, heat about 4 tablespoons of oil. Add mustard seeds, when they splutter add curry leaves. Within half a minute turn off the stove. Add the seasoning to the sambar. 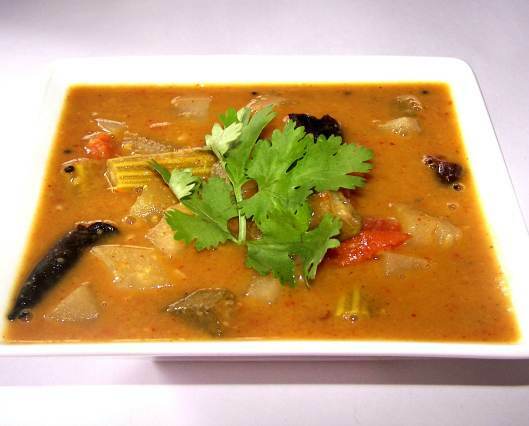 Garnish with coriander leaves and serve hot with rice or idli.